Great composition. Very beatiful shot. What a superb shot - absolute magic!! Great shot Rozmi, you captured life. I am agree with all the awards and I put this into my Favorites!! Wow! Great photo, no further comments. Excellent! Congratulations on the awards! Well deserved. I like how the two main people in the middle are looking out in opposite directions, gives a nice candid randomness to such a composed to the photo. I would like to see more contrast in the people (some white), although the flat tones work great for the stone. A great shot! Good diagonal, geometries, the human figure fits perfectly, different steps different moods. Good job. great! so funny..don't u think that cropping on the left side would be better? just asking.. Excellent composition, very effective in B&W. My besto compliments for this picture and for the Home page. beautiful! excellent work! congratulations for the award deserved! outstanding and congrats fort he double awards deserved iT! taken me a while to pay attention to your work ? I?m richer for it. who you are? are you MAGIC... tell me do you have two eyes, and one lens or do you have one more? I assume this is your first picture here, and what a debut. It's amazing, the diagonal composition is splendid, and the people filling up the diagonal is just perfect. Congrats!! This is a wonderful picture. I wonder: was it set up? Or did you really find this perfect situation to shoot? Anyway it is a very beautifull image. 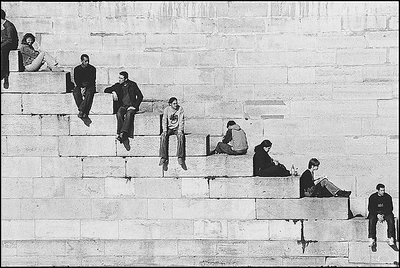 Great composition: how did you convince them to sit like that ? Very nice shot. Good lines. I like it. Bye. Perfect exposition to frame. Regards. Hi. No i did not pose them at all. just seen and shot. Greetings. Fantastic shot, very nice comp! Brilliant that there's loads of different types of poses from these people, did you get them to pose obviously?? great capture and use of a diagonal. really great, congrats. molto bella, essenziale nelle linee, animata dai soggetti.